Company now operating as one of largest Medicaid vision benefit management companies in the U.S.
March Vision Care specializes in the administration of vision care benefits for managed care organizations, specifically for government sponsored programs such as Medicaid, Medicare, Medicare-Medicaid Plans, and Healthcare Exchange. March also offers a broad range of fully customizable vision care programs to meet the needs of small to mid-sized businesses, self-insured corporations, unions, municipalities, employer groups and partnerships. 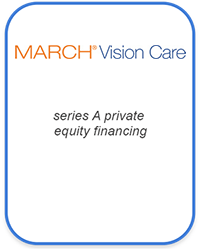 March Vision Care is a family-owned vision benefits company primarily covering Medicaid-eligible individuals. When March was in its early stage of development, Synergy was hired for a capital raise with a strategic partner that could provide both for growth capital and strategic growth. Synergy negotiated a capital raise with a strategic investor that benefited MVC by opening up several new state markets where MVC could service their partner’s existing network of managed lives. MVC now is operating in multiple states and manages eye care for over 4 million beneficiaries. This initial capital and business partnership allowed MVC to grow business to this level without needing to access additional external capital.